Finite Element Modeling and Simulation with ANSYS Workbench combines finite element theory with real-world practice. 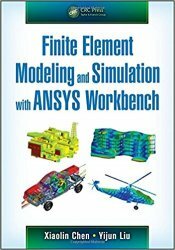 Providing an introduction to finite element modeling and analysis for those with no prior experience, and written by authors with a combined experience of 30 years teaching the subject, this text presents FEM formulations integrated with relevant hands-on applications using ANSYS Workbench for finite element analysis (FEA). Incorporating the basic theories of FEA and the use of ANSYS Workbench in the modeling and simulation of engineering problems, the book also establishes the FEM method as a powerful numerical tool in engineering design and analysis. The authors reveal the basic concepts in FEA using simple mechanics problems as examples, and provide a clear understanding of FEA principles, element behaviors, and solution procedures. They emphasize correct usage of FEA software, and techniques in FEA modeling and simulation. The material in the book discusses one-dimensional bar and beam elements, two-dimensional plane stress and plane strain elements, plate and shell elements, and three-dimensional solid elements in the analyses of structural stresses, vibrations and dynamics, thermal responses, fluid flows, optimizations, and failures. Contained in 12 chapters, the text introduces ANSYS Workbench through detailed examples and hands-on case studies, and includes homework problems and projects using ANSYS Workbench software that are provided at the end of each chapter.